Dental emergencies are frightening enough on their own without having to worry about where to find a qualified emergency dentist. Fortunately, the experienced emergency dentists at Bromley Park Dental are equipped and ready to treat most injuries and unexpected dental issues. Whether you’ve had a tooth knocked out or are experiencing sudden pain, our experienced and friendly general dentists can help you get rid of the pain and back on track. If you believe you or a family member has a dental emergency, please call Bromley Park Dental right away at 303-659-0667. Our phone lines are open 24/7 and we will do everything we can to get you into the office and out of pain as quickly as possible. A missing tooth: A number of long-term problems can be caused by missing teeth, so it’s important to contact us quickly if one or more of your teeth go missing. There are a number of options, such as a dental implant or bridge that can restore your tooth’s functionality and appearance. A loose tooth: While it’s expected for children, adults should never have loose teeth. Whether your loose tooth is caused by a recent facial injury or gum disease, you should visit our office right away to avoid losing your tooth. Swollen cheek or mouth: There are a number of culprits that can be responsible for a swollen mouth. You may need a root canal, or you may need to have a wisdom tooth extracted. Regardless of the cause, it’s important to contact our office immediately. Jaw pain: Pain in your jaw could be related to temporomandibular joint disorder (TMJ/TMD). TMJ disorder occurs when the jaw becomes misaligned, whether by trauma or a pre-existing condition. 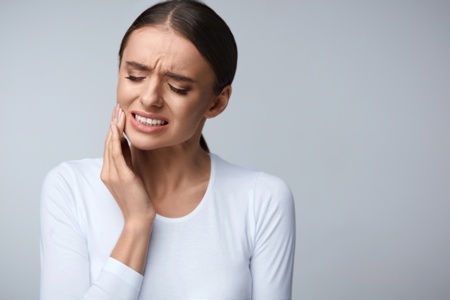 Severe mouth or tooth pain: If you experience discomfort or pain in your mouth, it’s important to seek help quickly and not just try to endure it. Tooth pain could be a sign of an abscessed tooth, which needs to be extracted immediately. Don’t put off the urgent attention you need. Many dental emergencies only worsen over time. Many emergencies can lead to infection, cracked teeth continue to fracture deeper, and jaw pain can lead to migraine-like headaches. Getting your issue treated immediately will save you time, money and discomfort in the future. If you have suffered a dental emergency, contact Bromley Park Dental now at 303-659-0667. We help patients from Brighton, Thornton, Commerce City and Ft. Lupton get the urgent care they need. Hablamos Español.